Stand-alone virtual classrooms in the LMS are a feature of the Learning Management System plan, which allows you to create virtual classrooms which are not tied to any courses. This may be useful, for example, if you want to start a catch-up session with a student who missed one of your classes. In this article we will also cover the Virtual Classrooms menu, where you can see records of all virtual classroom sessions on your academy (if you are the Organisation or an Administrator) or sessions you have participated in (if you are a Teacher or User). This includes both sessions opened as part of a course and standalone sessions. The Virtual Classrooms menu also lets you access interactive recordings for your past sessions. The Organisation and Teacher accounts have the ability of creating a standalone virtual classrooms whenever they need one. You can do this without having to schedule a session through a course. On your Dashboard you can see a button for creating a stand-alone virtual classroom. You can also create a virtual classroom by going to Virtual classrooms from the left side menu. Once you are there, you will see a green + Create new room button. Clicking on it will take you through the same process. 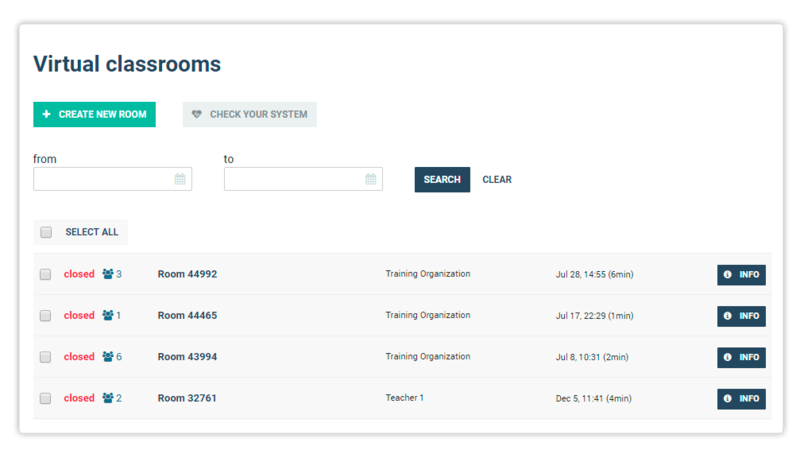 The Virtual classrooms menu gives you the option to keep track of active and inactive (closed) rooms on your account. This virtual classroom administration feature is not only useful to everyone who wants to keep track of the sessions they have taken part in, but also allows Administrators and Organisations to view all sessions conducted in your sub-domain. Tutors and Students can only see virtual classrooms they have participated in with their current account. To access the virtual classroom menu, click on Virtual Classrooms from the left-side menu. All of these filters can work together or separately to help you find the room you need. In the list you can see the title of your sessions, as well as the date and time when they took place. In order to see further details regarding a particular session click on the title of the room, e.g. Room 27184. 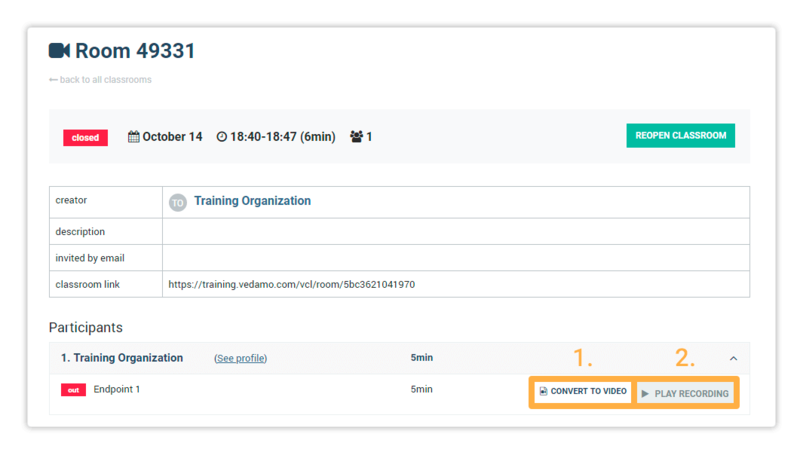 Convert to video allows you to convert the recording of the session into a video file (.mkv format) and download it. Converting takes as much time as the duration of the recording and, once converted, you can download the file and watch it on a video player installed on your computer or send it to your students. Play recording gives you access to the interactive recording of the session. In the interactive recording you also have the option of sorting and resizing the video windows, reading the room chat, etc, in addition to being able to skip forward or roll back the recording itself. NOTE: Rewinding (rolling back) the recording in interactive recording mode will refresh the room. You will need to press the Enter button again, after which the recording will start from the point you selected. Next, we take a look at the Templates management menu, where you can organise and share the templates created on your Learning Management System.